Designers of cloth airfoils: kites, sails, or parachutes, have a doubly difficult task. The foil shapes the wind (to put it poetically), but the force of the wind also stretches and shapes the foil, and so on, round and round in a converging circular process. The ultimate shape depends on a combination of built-in shaping and deformation of the cloth by the wind load. By contrast, designers of airplane wings and boat keels work with relatively rigid materials and the shape they draw is the shape they get. Cloth stress-strain behavior plays an important part in the performance of a cloth airfoil. Minimum stretch for the weight is usually best. Uniform stretch from lot to lot; color to color; and kite to kite is essential to making a high quality product. Sailcloth manufacturers usually test each batch of cloth for stretch, weight, porosity, and tear strength. Understanding these properties and the "graphs" which display them can help a designer to select the best fabric for a design. When a design is in production they can be used to select batches of fabric to insure performance and shape from one kite to the next. The figure above shows a typical graph for a production lot of North's Norlon 75. This is a type of fabric known in the industry as 3/4 oz ripstop. Ripstop refers to the square pattern of larger yarns or yarns woven together to create barriers to tears. Three quarter ounce would appear to refer to the weight per square yard, but it's not that easy. These fabrics typically weigh 1.1 oz per sailmaker's yard, which is 36" long but only 28.5" wide (28.5" is a throwback to the days of cotton sailcloth). So, 3/4 oz really weighs about 1.4 ounces per square yard. The weight will also vary a little from lot to lot and manufacturer to manufacturer. Under the "weight" in the data block in figure one the finish is noted as Melamine. Almost all fabrics used in kites, sails, and parachutes have some sort of polymer finish which stabilizes the cloth and helps to resist diagonal stretch. These are applied as either coatings spread on one side of the fabric, or impregnations which soak into the bulk of the cloth. Melamine is an impregnation with a polymer which is the same as that in Formica counter tops and those hard plastic plates they use on airliners. What are the differences between melamine impregnated fabrics and coated* fabrics and how do you choose when to use one or the other? Here are some rules of thumb. · Melamine finished fabrics are lower in stretch and higher in breaking strength than the same weight of coated fabric. · Coated fabrics, with their softer "hand", usually have higher tear strength than the firm melamine fabrics. · Coated fabrics replace fiber content with coating weight. Coating is cheaper than fiber. Therefore coated fabrics are less expensive to make. *The coating is usually urethane polymer similar to urethane varnishes and paints. 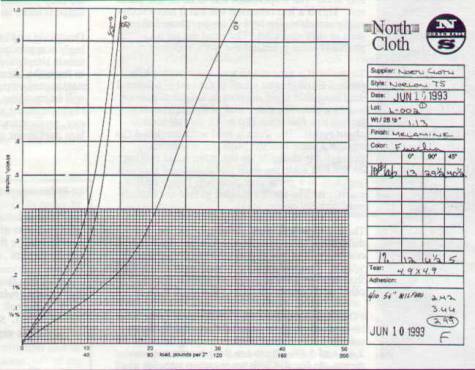 The 3 lines on the chart in figure one represent the stretch under load in three directions in the fabric; the 0 degree (warp or long direction in a roll of cloth), 90 degree (fill or cross direction in a roll), and 45 degree (bias, half way between the other two). Strips of cloth 2" wide are cut from each of the three orientations. These are clamped in the jaws (spaced 16" apart) of a tensile tester and are pulled apart as the load and elongation are charted. In figure one the load is read across the bottom of the graph and the elongation, in inches, shows on the vertical axis. The full scale load in figure one is 50 lbs. The full scale elongation is one inch. Each small square in the vertical axis represents 1/100 inch. Since the test sample is 16 inches long 16 small squares is one percent elongation. An important thing to notice about the elongation curves in figure one is that the 0 deg, or warp, is about twice as resistant to stretch as the 90 and 45. This is intentional. This fabric is intended to be used with the warp lined up with the highest loads in the sail. This is important to keep in mind when choosing the cloth orientation in a kite. the fabric "yields", the line curves, and plastic stretch takes place. Plastic stretch is permanent even after the load is removed. What does this mean to the designer? Generally it is wise to only use fabrics in their elastic range. If a sail or kite is used so as to load the fabric beyond the "elastic limit" it will be blown out of shape permanently. The 1% loads are entered at the bottom of the data block to help designers avoid this type of overloading. One percent elongation is usually near the limit of the elastic stretch range. There is a wide diversity of yarns to choose from in designing 3/4 oz ripstop. Some are better for clothing. Some are less expensive. The lowest stretch yarns are produced for industrial fabrics and are known as "high tenacity". As might be expected these are also the more expensive yarns. Fabrics with higher yarn counts and weaving density will have lower stretch. It is possible to weave a lower count, less expensive, fabric and finish it with a coating for low porosity, but this is at the expense of higher stretch. Impregnations and coatings are available in a range of hardness. It is also possible to apply more or less finish (either coating or impregnation) to adjust the firmness of the fabric. In general the trade-off is between cloth stretch and tear resistance. Firm finishes while achieving lower stretch lock the yarns in place so they can not bunch-up ahead of tears to stop them. Resistance to tearing in a woven fabric is a complex business depending on many variables. Fortunately it is usually sufficient to look at only two variables; yarn tenacity (breaking strength), and finish firmness. It is easy to see that stronger yarns will give higher breaking strength, and all things being equal, premium fabrics woven with high tenacity yarns will have higher tear strength. Finish firmness, either coating or impregnation, can make things complicated. A firm finish, bonded tightly to the yarns is often desirable to decrease stretch. But, this type of finish also decreases tear strength. An important mechanism in resisting tears in fabrics is the movement of individual yarns so as to bunch at the leading edge of the tear and create a smoothed out reinforced area to stop the tear. This is why cheese cloth is so difficult to tear even though the yarns are relatively weak. Flyers will also recognize the similarity with the practice of drilling a small hole at the leading edge of a crack in aluminum aircraft skins. What is sufficient tear strength? This will depend to some extent on the design of the kite and how it will be used. Usually firm, low stretch, 3/4 oz cloth should have tears of at least 3-4 lbs. Some soft, higher stretch, 3/4 oz products can have tears as high as 10-20 lbs. In general, fabrics of high tenacity yarn and firm finishes in which the finish is tuned so as to be as firm as possible without exceeding some lower limit of tear strength make the best fabric airfoils. Some manufacturers will emphasis the high tear strength of their cloth. But this is usually very soft cloth with poor stretch performance and shape holding. Different manufacturers use different methods to measure tear strength. The three most common are the tongue tear, trapezoidal tear, and nail tear. In the tongue tear a sample of cloth is pulled apart out-of-the plane. This is the most common tear test used in the textile industry, but it does not truly simulate what happens to sails and kites. The trapezoidal tear is an in-the-plane test. This is a less common test but it more accurately simulates the type of in-the-plane failure seen in sails and kites. The most simple and probably most practical test is the nail tear. To perform a simple nail tear test a push pin is pushed through and glued to the end of a several inch long thin rigid support (a tongue depressor works well). The other end of the support is attached to a fish scale (10 or 15 lbs full scale is about right). The cloth is held with one hand flat against a table and the push pin is inserted through the cloth. With the other hand pulling on the fish scale the push pin is dragged through the cloth in a particular direction (warp or fill) tearing it. The force required to tear the cloth is read directly on the scale. The different test methods will, of course, give different results on different fabrics. To avoid confusion it is best to pick one method and stick with it. You will eventually gain experience with that method so as to judge one fabric with another and various batches of the same fabric. In the lower right corner of the graph in figure one there are three numbers varying between 2.42 and 3.66. These are the porosity measurements. At North Cloth we measure porosity at three positions across the width of the test sample. The units are in cubic feet per minute per square foot at 0.5" water pressure. In other words the testing machine applies a pressure across the fabric sample which is sufficient to support the weight of 1/2 inch of water. (This is a low pressure, but it is about the same as the differential between the top and bottom of a kite in flight. Consider that the atmospheric pressure where you are sitting is enough to support the weight of about 30 feet of water). At this steady pressure a reading of 1 would mean that a cubic foot of air would leak through a square foot of cloth in one minute. This is a velocity of air through the cloth of 1 foot per minute or 0.011 miles per hour. Why is porosity important? Is zero porosity necessary? Military specification parachute cloth has both a minimum and maximum porosity requirement. The minimum porosity allows a small amount of air to pass through the fabric. This turbulates the boundary layer, keeping the flow around the top of the chute attached, and stabilizes the parachute. Obviously very high porosity is not good because it can reduce the pressure differential across the airfoil and throw away lift. There are many opinions and no certain answers regarding the best levels of porosity. Experience in making a large number of kites and paying attention to the effects of porosity is probably just as good as most theories. At North we keep porosity below 4.5cfm/sf, and feel that shape is more important. Designing and making cloth airfoils is a deceivingly complex pursuit. Building an aerodynamic shape, anticipating what the wind will do to form the ultimate shape, and what the dynamic performance in gusts and maneuvering will be, requires an understanding which includes both art and technology. Cloth technology, performance, and stretch play an important part in the process.